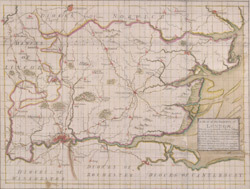 This drawn plan was probably a draught for the map of the Diocese of London published by Jacob Robinson between 1723 and 1748. The title and an explanatory note appear in a square table at the bottom right. The boundaries of the diocese are outlined in red and all the churches within the diocese indicated by a red symbol.